Pre-assembled model kit of Robert Downey, Jr.'s Iron Man Mark 43 from Marvel's Avengers Age of Ultron! Whether you've been reading the comic books for decades or just really enjoy Marvel's Avengers franchise, this is the model kit for you! Everyone knows Tony Stark saves the world with style and flair, and his iconic suit has never looked better. Featuring a dynamic pose from Avengers Age of Ultron, this superb model kit shows the Avenger on a diorama base. 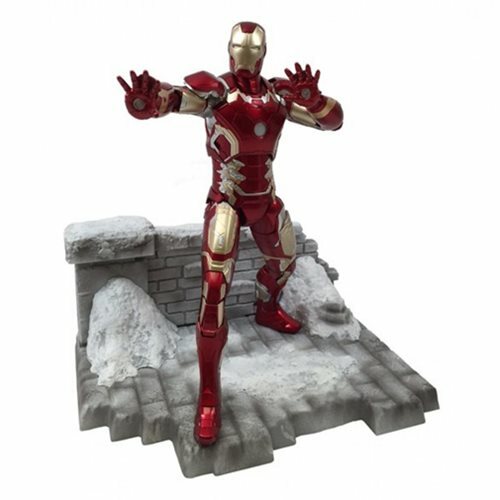 The Avengers Age of Ultron Iron Man Mark 43 Action Hero Vignette 1:9 Scale Pre-Assembled Model Kit comes pre-painted so with just the snap of a few parts, you can have a highly detailed desktop display of your favorite Avenger! Stands approximately 7-inches tall. Ages 14 and up.